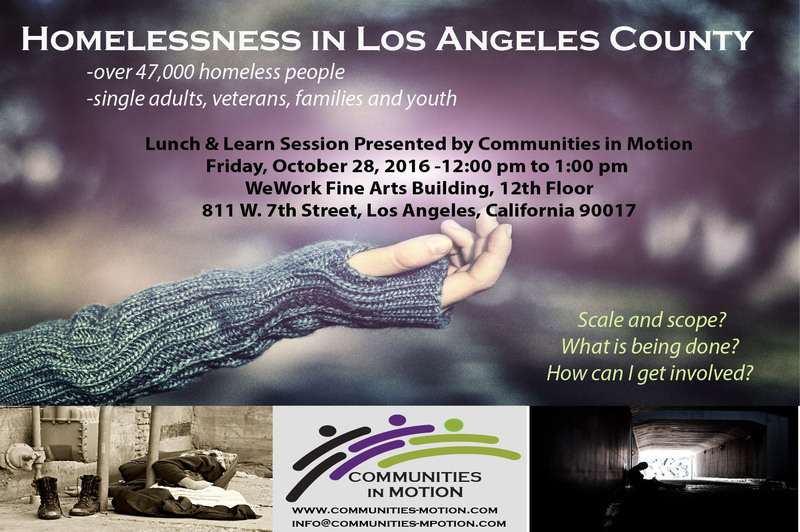 Com­mu­ni­ties in Motion will be dis­cussing home­less­ness host­ed by WeWork Fine Arts Build­ing this Fri­day, Octo­ber 28, 2016, 12:00 pm to 1:00 pm i n Down­town Los Ange­les. Lunch will be served. RSVP by Wednes­day Octo­ber 26. For more infor­ma­tion, please email info@communities-motion.com or call (424) 320‑0120. RSVP online using the form below.